Another one of Aunty’s ambitions was to climb Cader Idris, so a couple of days after our failed attempt on Tryfan we had to try. I was born almost in the shadow of Cader Idris, and I’ve passed it thousands of times, and climbed it on numerous occasions, the last time over 30 years ago. The mountain itself hasn’t changed, but its popularity certainly has and there were quite a few people up there, but it didn’t feel crowded. But that said its still a great day out. Ascending through the steep wooded Ystrad Gwyn following the fast flowing Nant y Gadair up to Llyn Cau. There are a number of routes up Cader, but this time we took the frontal assault and climbed up the Minffordd Route. This route is a bit under 3 miles each way and is the shortest but perhaps the steepest path. It does involve the greatest ascent and even though 6 miles doesn’t sound far it does need 5-6 hours to complete the ascent and descent. It starts at a car park just after the junction of the A487 and the Dolgellau to Tywyn road. We climbed through an ancient oak wood, the path rising steeply up to Cwm Cau. Past a marshy hollow, there are three large boulders, the “stones” Idris shook out of his shoe. Llyn Cau nestled beneath the Cader Range, On the left is Crair Lwyd, in the center is Craig Cau and on the right is the summet of Pen y Gadair. After another further steep climb up following Nant y Gadair through Ystrad Gwyn, there is an easier ascent into Bwlch Cau before a final very steep, slippery and eroded ascent to Pen y Gadair. I grew up knowing that Cader Iris was an extinct volcano, and that Llyn Cau was the remains of that volcano and created from the cone.. However that belief was wrong. In fact the natural bowl-shaped depression was formed by a cirque glacier during the last ice age when snow and ice accumulated in the corries due to avalanches on higher slopes. In these depressions, snow persisted through summer months, and became glacial ice. The cirque was up to a square kilometre in size surrounded on three sides by steep cliffs. The highest cliff was the headwall. The fourth side was the “lip” from which the glacier flowed away from the cirque. 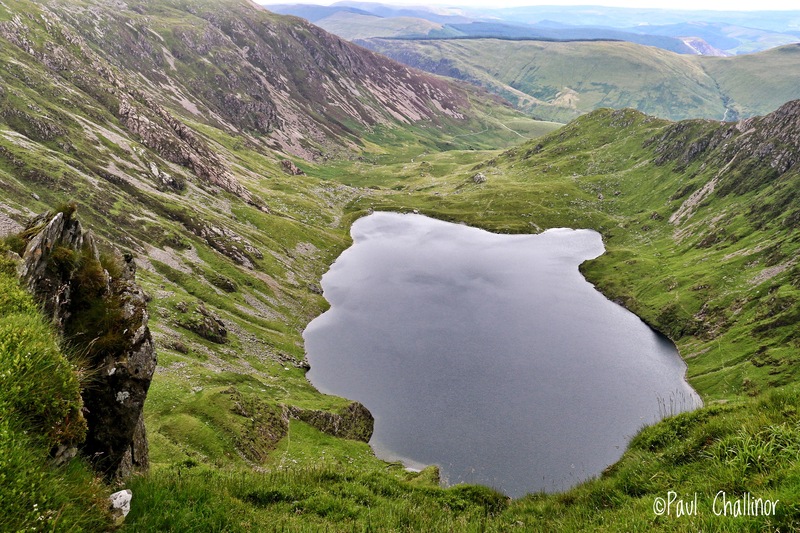 Over thousands of years ice flowed out through the bowl’s opening carving the chair of Cadair Idris. The higher we climbed the better the views became. I’ve always looking looking down into the Talyllyn Valley, but this on this occasion the light also lit up the valley into Corris, a small slate quarrying village, devoid of jobs now the quarries have closed, but still surrounded by the memories of time passed in the small mountains of grey slate waste left behind. Looking down onto Llyn Cau from the ridge between Craig Lwyd and Craig Cau. From here is it easy to see the gap which the glacier carved out of the ancient rock. However the views didn’t last long. The cloud started to descend and before long we were surrounded by a thick wall of white only able to flow the path along the ridge to the summit at Pen-y-Gader. This was disappointed sa I had so wanted to show Aunty the fantastic views down toward the sea and north towards Snowdon. Not much to see up here! 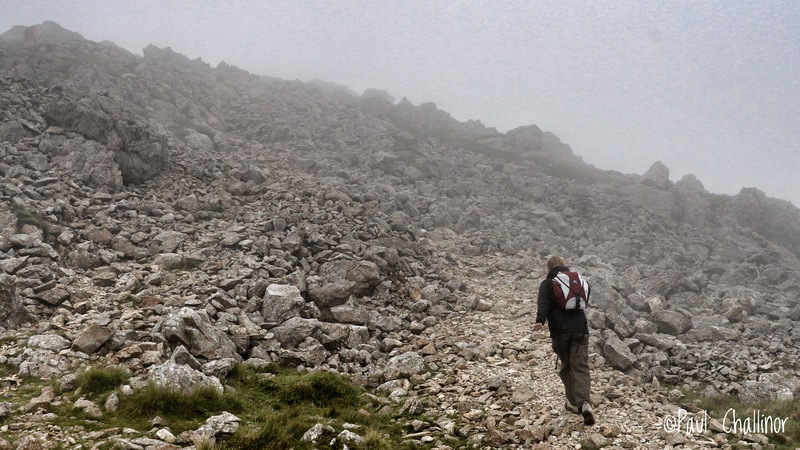 The last ascent to Pen y Gadair. We waited a little, hunkering down in the shelter of the ruined other on the summit eatin lunch. But the cloud refused to lift, and we were getting a little cold so we started the climb down. But the most important thing is that Aunty climbed a mountain, and bagged all three peaks on the range. Cader may not be a high mountain by European standards, but the over all ascent that we achieved equates to the average that people do in the Alps. There they start at a higher altitude and still only achieve an ascent of 1000m. Here we started almost at sea level and achieved the same total ascent. Bloody well done Aunty! Occasionally the clouds cleared briefly to allow views down to the north and Llyn y Gadair and the Mawddach River. 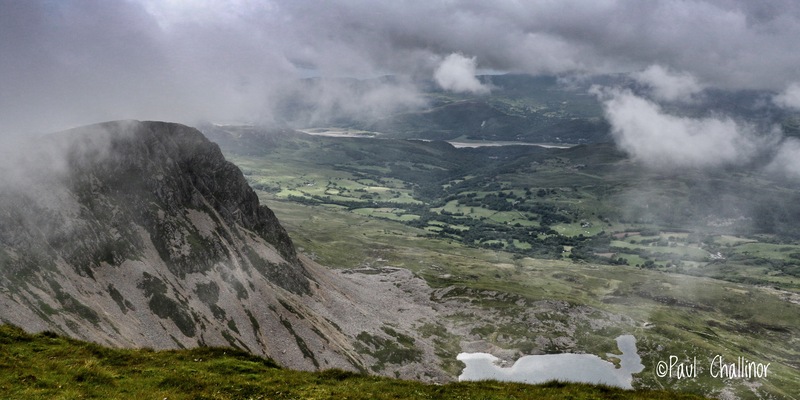 Cadair Idris means ‘Idris’s cadair’. 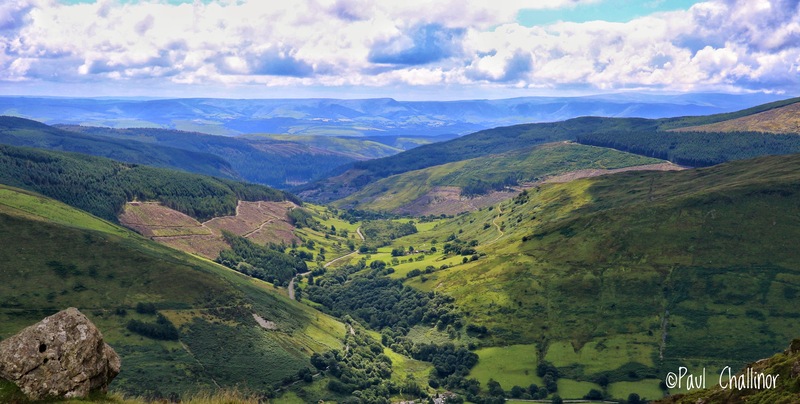 Idris is usually taken to be the name of a giant or, alternatively, it may refer to Idris ap Gwyddno (or Gweiddno), a 7th-century prince of Meirionnydd who won a battle against the Irish on the mountain. Idris ap Gwyddno was in fact referred to as Idris Gawr (“Idris the Giant”) in some mediaeval genealogies of Meirionydd. Idris the Giant was said to have been so large that he could sit upon this mountain and survey his kingdom, though his real epithet may have been Arw (the Coarse). The story may derive from Idris having retired to a small hermitage on the mountain. His grave, Gwely Idris, is also said to lie up there. He must have re-entered secular life before his death, however, as Idris was killed fighting King Oswald of Northumbria on the Severn in 632. He was succeeded by his son, Sualda (1). Would you believe it! The cloud lifted as we descended and Talyllyn came into view. 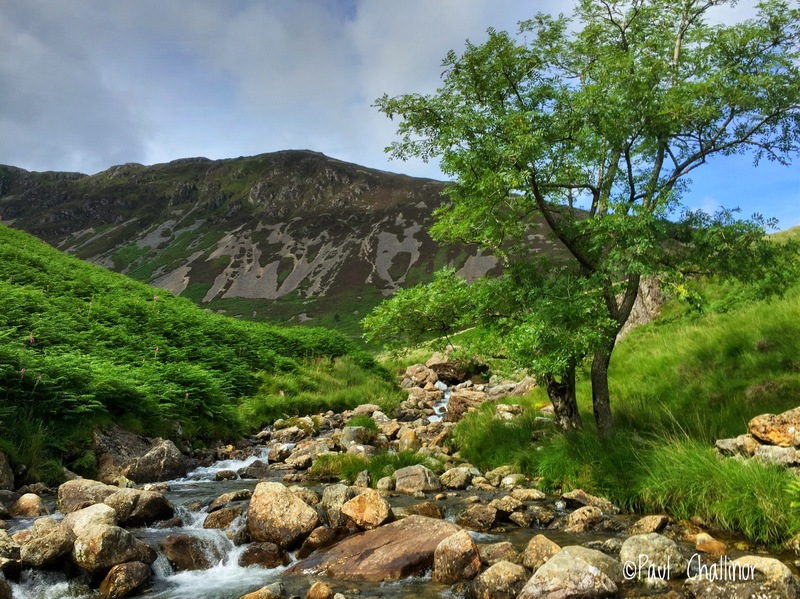 In Welsh mythology, Cadair Idris is also said to be one of the hunting grounds of Gwyn ap Nudd and his Cŵn Annwn. The howling of these huge dogs foretold death to anyone who heard them, the pack sweeping up that person’s soul and herding it into the underworld. Just as we came back to join the Nant y Gadair at the top of Ystradffin Gwyn the cloud lifted further, the sun came out and blue sky appeared. Aunty was not keen to climb back to the top again though. I felt their dim presence,–but knew not their forms ! A flame all immortal, a voice, and a power ! When the sense which gives soul to her beauty was won ! Hemans, Felicia Dorothea. The Poetical Works of Felicia Dorothea Hemans London: Oxford University Press, 1914. pp. 176-177.